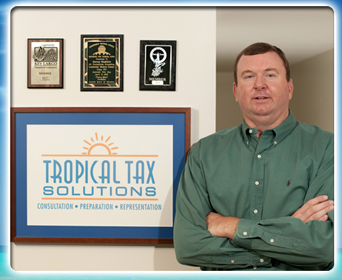 Jerry Gaddis is the founder and CEO of Tropical Tax Solutions. He has been in the tax business since 2004, earned his Enrolled Agent license in 2009 and became a Fellow in the National Tax Practice Institute in 2012. He holds an undergraduate degree from the University of Florida and an MBA from the Crummer Graduate School of Business at Rollins College in Winter Park, FL. Gaddis has been speaking and writing about taxes for more than a decade. He has been quoted in various publications including Forbes, Kiplinger, Florida Trend and many others and has been a regular contributor to US News since 2018. He also spent several years on the radio helping taxpayers in South Florida stay up-to-date on developments in the tax industry. To book Mr. Gaddis for a speaking engagement, please contact the office. Gaddis is a native Floridian who developed his customer service orientation during a decade of working in the Walt Disney World theme parks. In his spare time he enjoys getting outdoors and enjoying all that Florida has to offer. He and his faithful companion Rusty are currently working toward therapy dog certification. You can learn more about Jerry and connect with him on LinkedIn and Twitter.